I have interviewed a number of professional cycle racers over the years and it has been great to hear their stories. One person I had not managed to meet was champion downhill mountain-biker Tracy Moseley. I was keen to meet her, particularly as her name was regularly being mentioned by other mountain bikers who mentioned her as their inspiration to push themselves in mountain biking. And it's no surprise that people wanted to emulate Tracy. She was at the top of her game for 20 years, racing downhill and enduro mountain biking events. 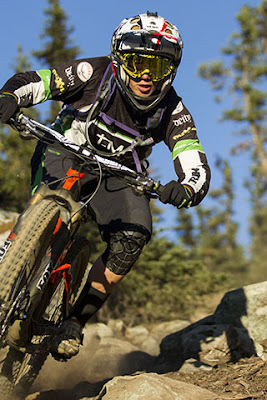 In 2010 she was crowned World Downhill Mountain bike champion, and subsequent to that she gained world titles in Enduro mountain biking events too. I finally got to meet this member of the downhill and enduro mountain biking royal family at the London Bike Show earlier this year, and she talked about how she would like to encourage girls into racing downhill. “I grew up on my parents’ dairy farm in Malvern, so we had that freedom of the outdoors to ride and play and make tracks in the woods. It was my brother, Ed who inspired me to do downhill racing. He’s two years older than me and started doing cross country racing when he was about 15 or 16. So it was more about following him, and riding with his friends. Ed helped me out so much at the start and he was the one who said, “You know what Tracy? You need to have a go at racing. You can ride better than all the girls I’ve seen and most of the boys I ride with!” So he was the one who pushed me and encouraged me, and in the first few years he was a massive help. Ed still rides lots as well and we hope to do some kids’ coaching camps with my brother and my husband. So it’s going to be a family unit, which is great to still be able to share that fun on the bike with him, nearly 30 years later. I still live in Malvern, so it feels like I haven’t actually gone very far. I’ve just been away to uni and then travelled so much with the racing. Even my brother still lives there. We’ve converted some of the old farm buildings and we’ve both got our own little place. It’s been a great base to have. We’ve got great riding locally both on-road and off-road. I love going to our local trails and our local club, Malvern Cycle Sport has been great. At the moment I don’t see any need to go anywhere else! Malvern doesn’t really have anything technical in terms of downhill, but we can be in Wales within an hour. We can easily get to Bristol, and London is less than two hours away. So we’re in a nice location that is central to get to places. My first world downhill mountain bike championship title came in 2010, after many years of trying, and then after that I had a good spell of titles for the last few years of my career, with three world enduro titles too. In a way gaining my first title was a huge amount of relief. I’d spent 10 years or more with that goal, and then I suddenly achieve it and I’m like – now what? I’d sacrificed so much for my training - lifestyle, friends, family - everything to try and achieve that goal. So winning that title led me to carry on and try a new challenge – which is where the enduro biking came in. It was a new discipline, I had to get fitter, lose weight, and become an all-round athlete rather than just a downhill focused athlete. That gave me that next step kind of feeling of trying to achieve something else, hence the enduro titles. Then when I achieved that I wanted to try and find that next thing. I still race and challenge myself, though not at elite level. I did the Snow Bike Festival in Gstaad at the end of January this year, and then I went straight from minus 11 degrees to plus 40 degrees, and did the Andes Pacifico, a five-day enduro in Chile. It was a kind of adventure race where we were high, in the Andes Mountains for the first three days and then descended towards the sea. There was a lot of time on the bike, with three or four timed stages of 8-10 minutes each day. It was really raw terrain, that wasn’t really well marked and needed a bit of navigating. It was a really good adventure. I also took part in this year's national cyclo cross championships in Bradford. I’d been supporting a few youngsters in my local cycling club, Malvern Cycle Sport, and we went up to help in the pits and the bike washing, so I thought I might as well enter the race if I’m up there! It was very slippery, I was super out of shape and I suffered. It hurt a lot but I just pushed hard, and I was happy with where I finished, considering. I am always looking for the next crazy challenge. Hopefully one day I will be able to stop those desires! When I started racing downhill I looked up to Anne Caroline Chausson, who was at that time, the 10-time world mountain bike champion. She’s always been quite introverted, but an absolutely amazing bike rider. And that, for me was always the most important thing. I didn’t want to be this huge celebrity; I wanted to be known for my riding and how good my riding was, and that was the thing I really admired about her. She could keep up with the guys, she was as stylish as the guys, and she didn’t shout about it. She just got on with it. Often these days you get many many characters that can talk a good bike race but actually can they do it themselves? I’ve always liked that side of making sure that your riding does the talking for you and Anne Caroline Chausson did that really well. It’s quite cool and really nice of Rachel Atherton and Manon Carpenter to say that they looked up to me, and it makes me take account of what I have done in the past. It feels good to know that I have done something to help the next generation. Rach was someone I raced against, and racing against her kept the level high and inspired me to raise my game. 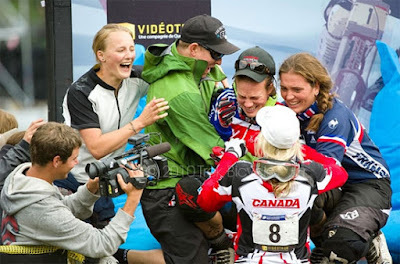 It’s great to see what she’s gone on to achieve in the downhill world, and again hopefully she’ll be an inspiration for the next batch of racers and we will continue to have a great nation of downhill riders. But yeah, it’s certainly really nice to realise that they looked up to me and it’s helped them in their career, for sure. I stopped racing professionally in 2015, though I am not fully retired from racing. I didn’t really want to use the word “retire” because it felt like there was a definite end. I’ve got that kind of gene, that kind of thing that makes me want to have the drive to compete so I’m still going to be racing a little bit, but just not at world series level. This has given me more chance to do other things rather than just be focused on training for those few events that make up the World Series. So change of direction would be a way to describe it, rather than retiring – it’s not as though people aren’t going to see me out racing again. Last year I did a couple of races, this year I’m doing a few less races and am doing more coaching, more talks, more conferences doing work with the sponsors. Yeah, it’s been nice to slowly wean myself off professional racing. I think I would have struggled to suddenly stop, given I have spent my entire life since I finished uni just racing bikes. Nowadays I am involved in coaching and developing young riders. The good thing about that is that it still gets me to races, so I go to events with the young girls. I’ve got two girls that I sponsor in downhill and cross-country with my TMO Racing grass roots training programme, and I’ve been getting them to do some enduro. They’re also racing cyclo cross and road, so they’re doing a bit of everything. I’m a huge advocate of trying to make sure, especially when you’re young, as you definitely broaden your riding. You don’t just focus on one discipline, as I think you can gain so much from different skills in the different disciplines. I was doing a bit of work with British Cycling and their cross-country programme, working with the girls in that squad, trying to improve their technical skills and cross-country racing. I do a little bit of work with my own cycling club, Malvern Cycle Sport, which is a really active club that has been running kids’ training camps. I really enjoy mentoring the next generation. There are plenty of people out there coaching adults, but I really feel like we still need to keep encouraging, certainly on the mountain biking side, the next great champions of our country.It would be great if I could help bring in more kids to the sport and see where we go from that. That’s the plan. Cross-country is the only mountain-biking discipline that gets any funding from British Cycling, as it is an Olympic sport. The disciplines that I enjoy – downhill, gravity-assisted things – are very much dependent on clubs or the parents of those kids. There’s no system for that so that’s where I really want to put my effort. There are so many kids out there that aren’t going to make it in that very select programme that British Cycling creates and then the kids get put off racing for life, which is a shame. Basically, you don’t have to be an Olympic champion to enjoy racing your bike. And that’s the key thing for me – to make sure that kids can still have that love for cycling and they don’t get put off because they haven’t made that cut-throat world of high-level racing. Downhill racing has been talked about as possibly becoming an Olympic sport but I don’t know if it ever would. At the moment it is a grass roots underground sport, and in many ways that’s what a lot of people like about it. If Olympic funding comes in it will become a proper structured programme, with people being selected. It would change the atmosphere of the sport a lot. And I’m not sure if it would be for the better or not. Cycling is definitely getting more mainstream. It’s just that for mountain biking it’s always going to be a struggle when we don’t have the TV coverage. Rachel (Atherton) has been fortunate with the Red Bull sponsorship as they have put so much backing into her, and helped to push the sport and make sure the press know what’s going on. We’re probably the most dominant downhill mountain biking nation in the world, with world champions in the men, women, and junior categories, yet most people in the general public would never know, which is a shame when you consider what we’ve achieved. Generally, when there’s a downhill race men’s and women’s races get featured equally. However, salary wise women are still falling behind then men, but I think that comes down to the fact that there are so few girls racing downhill compared to the men, and that makes it hard for bike companies to justify paying them the same. I still feel that we get a great opportunity as females within our sport and certainly when you get to the top of your sport. There are only about 15 or 20 girls racing downhill at world series level, whereas there are over a hundred guys competing at those levels. So the thing for me is I’d love to see more girls taking part. If we can get our field to be equally as competitive as the men’s then we can be in a place where we can ask for equality in everything. We just need more girls doing it – we need the numbers. And that will hopefully bring more support and more opportunities. I have made a lot of friends through cycling. I feel like I could travel the world now and pretty much be able to visit someone I have met through mountain biking almost anywhere in the world. Just that common bond of the love for riding a bike is amazing – where it takes you, the people you meet – it’s absolutely incredible. Every race I do – even the one I did in Chile – I meet new people and I get new contacts and it’s a lovely kind of extended family, seeing people I know everywhere I go. Initially, cycling was something I was good at – I was competitive, and I liked to win. 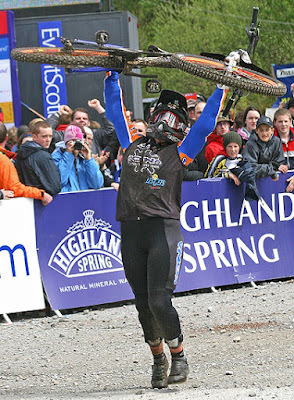 I never would have expected to still have a career in racing a mountain bike 20 years after I left school. It was never planned; it just evolved that way and it’s been amazing. As I’ve got older my interests have changed, and cycling has now become so much more than just competing, and if I never raced again it wouldn’t matter – the fact that I could ride my bike is the more important thing. The places that cycling takes you, the feeling that you get from being free to have your own mode of transport and the achievement of getting from here to the top of a hill, looking down, and thinking, “I did that all with my own leg power” is quite cool.